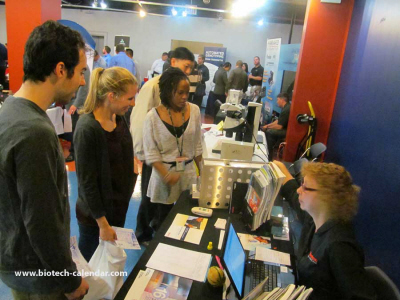 Some of the best sales representatives at Biotechnology Calendar, Inc. life science marketing events are friendly and approachable, make the extra effort to talk with attendees, and take an educational approach to informing potential customers about products. Customers who feel as though they know a company’s life science products well rather than feel as though they sat through a sales pitch designed to sell lab equipment will be more likely to make a purchase. Researchers also trust salespeople who talk to them about how a product fits in with their research goals, especially if a salesperson can help them find a product that’s conspicuously missing from their research. Great sales reps ask their customers a lot of questions to get to know who they are and what their product needs are. These reps can predict their clients’ future product needs based on the information they have. They also know who their competition in the market is and how their products and services compare, and they have in-depth knowledge of the industry as a whole. (To learn more about research and industry news, see our Science Market Update). Always informed about industry trends, great sales reps know how to make themselves stand out from the crowd. After a sale, a sales rep should also follow up with customers because they know that the first sale is just the beginning of a longer relationship. At the end of every trade show, Biotechnology Calendar, Inc. selects a winner of our Five Star Program who showed outstanding marketing and salesmanship skills in working to sell lab equipment and life science products. Our Five Star Winners are great communicators, demonstrate their products to any attendees who are interested, act professionally throughout the show and create attractive displays. Our Five Star Winners usually attract a large number of attendees to their table, communicate their product’s message superbly and work until the very end of the show. Five Star Winners receive an e-mail to all of our vendors announcing their award, a framed certificate, a post on our website with their company’s logo and a link to their company’s website, and a blog article spotlighting their outstanding performance working to sell lab equipment and market their life science products. Five Star Winners can tell their family, friends, supervisors and colleagues about their first-rate work at recent life science marketing events because their award is a testament to their exceptional salesmanship. Those exhibitors who win awards at more than one of our life science marketing events have an increased opportunity to be selected as the overall Five Star Winner at the end of the year. The overall winner will receive a bigger prize, which we will announce on our website and blog. Biotechnology Calendar, Inc. is thrilled to announce the Five Star Winners of our Midwest region life science marketing events so far this year. Click here to see a full list of our 2013 Midwest region life science marketing events. Congratulations to the winners for your fantastic salesmanship and friendly marketing working to sell lab equipment and market life science products! Congratulations, and we hope to see you again soon!